ASHEVILLE, N.C. — “A Vanderbilt Christmas” is the theme at Biltmore Estate this holiday season, with the annual celebration running through January 7 at America’s largest home. The 35-foot banquet hall tree, a Fraser fir, is the star attraction year after year during Christmas at Biltmore. 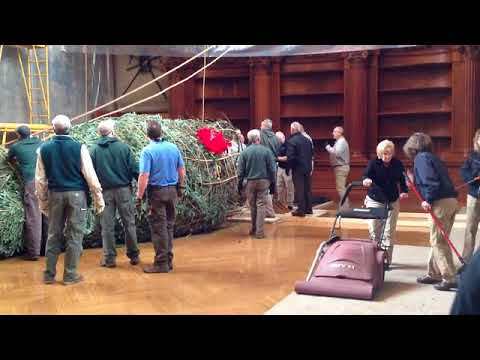 This season’s tree was delivered on Wednesday by horse-drawn carriage, driven by no less than Santa Claus himself. Once he and the horses got it to the 250-room chateau’s front door, it was hoisted inside by more than 40 Biltmore employees in what has become a tradition. Also in keeping with tradition, Biltmore Company President and CEO Bill Cecil Jr. attended the tree-raising, mingling with employees and estate guests. Cecil is the great-grandson of George Washington Vanderbilt, who founded the estate and first celebrated Christmas with family and estate workers in the then-new mansion in 1895. Cecil’s father, Williams Amherst Vanderbilt Cecil — credited with preserving Biltmore, developing a thriving business, and on a wider scale being a champion of tourism in general throughout Western North Carolina since the early 1960s — died a day earlier at 89. The tree was grown by Andrews Nursery in Avery County, N.C.
As custom dictates, the tree is decorated with 500 ornaments and wrapped packages are tucked into its branches. It serves as the seasonal centerpiece in the immense banquet hall. In a bit of a break with tradition, the banquet hall — including the 35-foot Fraser fir — is decorated in blue, white and silver. And there are two large trees trimmed to match on the other end of the room, flanking the large marble mantle. The shade of blue and the luxurious texture of the velvet ribbons — some fashioned into blossom-like ornaments — complement the colors and textures of the tapestries that adorn the room’s walls. If you’ve ever worried you were cutting it close on getting your holiday decor plans finished in time, consider this: Biltmore’s floral team begins planning for each year’s decorations, room-by-room, before the current Christmas is even over. Those blue velvet ribbons were ordered months ago but only arrived within the last couple of weeks. More than 100 Christmas trees — each decorated and styled by hand — grace the house and estate. The conservatory is filled with poinsettias and tropical plants and offers a daily complimentary seminar that provides tips for guests’ own holiday decor. New this year: Biltmore Winery is decorated with 7,000 globe-shaped ornaments hanging from the ceiling, giving guests the feeling of being inside a bottle of sparkling wine. Free tastings of Biltmore wines are offered among the festive decor. Weekends in Antler Hill Village feature carolers sharing Christmas favorites and Santa making appearances at the bandstand to hear wish lists from guests of all ages. Enhanced this year with even more sparkling lights, Antler Hill Village is a must-see: Buildings are outlined in lights, a fountain is lit with special visual effects and there are illuminated trees and ornaments in abundance. An additional charge and advance reservations are required for Candlelight Christmas Evenings in Biltmore House, which run through Jan. 6. These evening tours allow guests to step back in time with an experience more like George Vanderbilt’s guests had during their first Christmas Eve spent in the mansion in 1895. Local musicians and vocal groups perform Christmas music along the tour. Setting the scene is a 55-foot Norway spruce sparkling in the center of the front lawn and surrounded by 20 illuminated evergreens. Luminaries line the walkway to the house. For more information, visit www.biltmore.com.